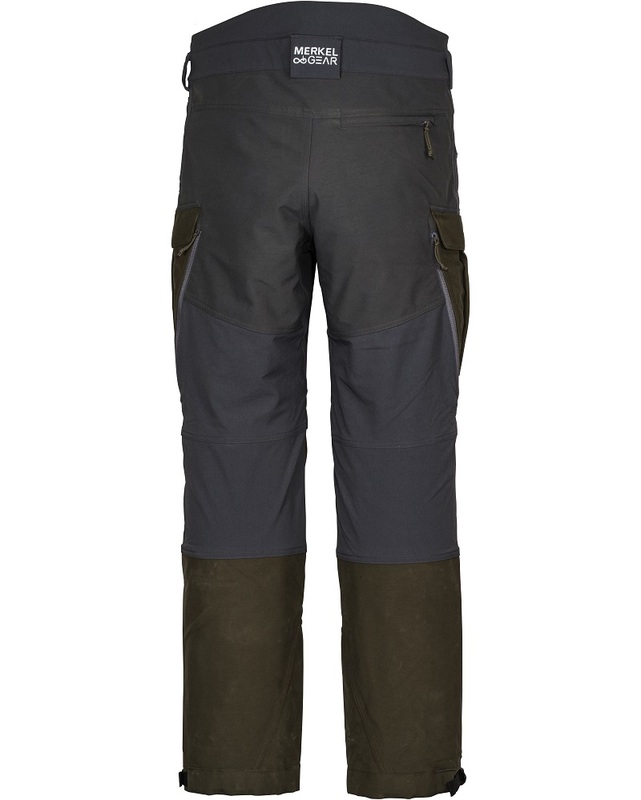 The Palaearctic HYBRID trousers are designed for active hunting in almost any weather in medium to cold temperatures. 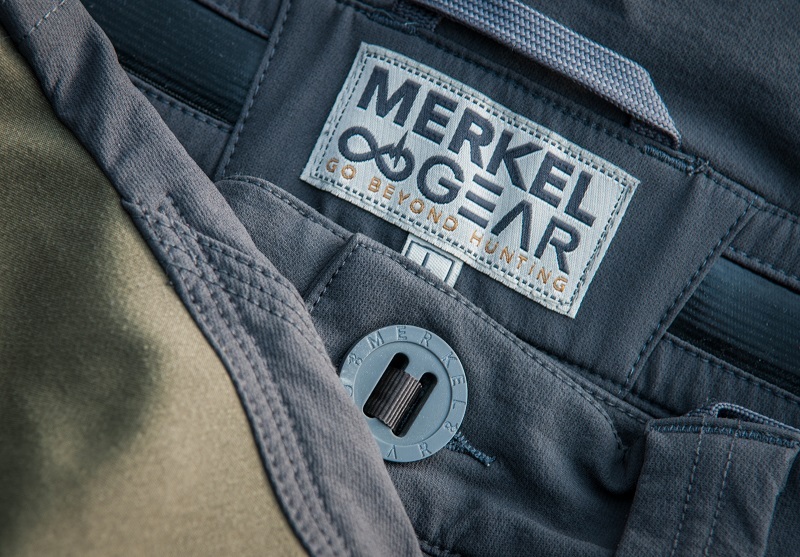 Thanks to 25cm long, strong ventilation zips, the „HYBRID trousers“ can also be worn well during summer hunts and mountain hunting on warm autumn days. The special feature of these trousers is the unique combination of 100% waterproof (thermally sealed seams) sections (front area to the cargo pockets, rear area to just below the back of the knees and the entire seat), and strong, highly breathable 4-way stretch sections for maximum freedom of movement. This way, you are protected against moisture in high grasses, but thanks to the stretch sections you’ll feel very comfortable and thus can remain concentrated. Pure hard-shell jackets and trousers usually make you sweat most of the year due to the lack of temperature difference with the outside surroundings. It does not matter which membrane is used, as each membrane requires a temperature difference of around 15C° in order to work properly. With the MerkelGEAR HYBRID trousers, however, excess heat can escape at the level of the nylon stretch and via the long ventilation zips. The 3.5 layer laminate (37.5™ membrane, 20.000mm / 20.000g/m²) built into the waterproof parts has a low-noise, slightly roughened surface. In an extensive test phase, this fabric has also proven to be extremely robust. The inside of these waterproof parts is finished with soft jersey, which does not absorb water and thus remains dry and warm. The seat of the MerkelGEAR HYBRID trousers is made of the ultra-strong and waterproof Oxford fabric (37.5™ membrane, 20.000mm / 20.000g/m²), already known from the MNTN and the WNTR trousers. The stretch sections above the front waterproof facings and at the level of the back of the knees are made from highly breathable, 2-way stretch and very durable 4-way stretch nylon fabric. An improved DWR finish (PFOS- & PFOA-free) lets water run off easily and if the stretch fabric does get wet it will dry very quickly. The HYBRID trousers are, in our opinion, the ultimate pair of trousers if you are looking for a well-made and highly reliable all-rounder for hunting in Central Europe! A variety of functional details together with the further improved MaxComfort waistband system, a modern fit and innovative integral seams on the cargo pockets result in a pair of trousers that is second to none: lengthened kidney protection in the back, strong belt loops, non-slip stretch waistband with 1.5cm wide silicone coating. With integrated, soft hooks for the optionally available braces. Two loop buttons at the front keep the trousers 100% closed. 1 back pocket with zip. 2 deep pockets made of ultra-soft fleece, 2 cargo pockets with integral seams (water can run off + pocket is inseparably sewn into outer fabric). One with a silent zip and integrated smartphone pocket, the other with the removable MerkelGEAR cartridge patch. The right cargo pocket also has a generous knife pocket. Silent (without metal parts) YYK ventilation zips size #5. Triple preformed knees. Outwardly fashioned seams at the hem (shark fin shape for the use of crampons). Silently adjustable leg cuffs. A strong shoe hook which, when not in use, disappears in a textile loop to e.g. not to press in rubber boots, can be anchored to mountain boots. Thus, the trouser legs are prevented from „riding up“. Strong double or triple-stitched seams made of heavy-duty yarn guarantee a long durability of the Palaearctic HYBRID trousers. A generous gusset in the crotch sustainably relieves the crotch seams.